A.Marousis, N.Skentos, P.Constantinou, ‘An Enhanced Embedded-Pilot Channel Estimation Architecture for MIMO MC-CDMA Systems’, DOI: 10.1007/s11277-010-9933-7, International Journal on Wireless Personal Communications, Springer, ISSN: 0929-6212, 2010. A.Marousis, P.Constantinou, “Evaluation of an Orthogonal SFBC Channel Estimation Scheme for MIMO OFDM Wireless Systems”, DOI: 10.1007/978-3-540-70760-8_23, Communications in Computer and Information Science, e-Business and Telecommunication Networks, J. Filipe, M.S. Obaidat (Eds. ), Springer Selected Papers Book, CCIS v.9, pp. 290-300, ISBN: 978-3-540-70759-2, Springer-Verlag, July 2008. N.Skentos, A.Marousis, A.Kanatas, P.Constantinou, ‘Experimental Multipath Component Characteristics for Short Range Urban Propagation Environments’, European Transactions on Telecommunications, Volume 18, Issue 6, pp. 595-603, October 2007. A.Marousis, P.Constantinou, ‘Adaptive Turbo Code-Multiplexed Pilot Channel Estimation for MIMO MC-CDMA Systems in Highly Time-Variant Channels’, European Conference on Antennas and Propagation, EuCAP 2009, 23-27 March 2009, Berlin, Germany. A.Marousis, P.Constantinou, ‘Performance of a Full Rate Quasi-Orthogonal Extended MIMO MC-CDMA System with Efficient Channel Estimation’, IEEE International Symposium on Wireless Pervasive Computing 2008, ISWPC08, 7-9 May, 2008, Santorini, Greece. A.Marousis, P.Constantinou, “An Enhanced Transmit Diversity Scheme for MIMO MC-CDMA Systems using Three Antennas”, European Conference on Antennas and Propagation, EuCAP 2007, 11-16 November 2007, Edinburgh, UK. A.Marousis, P.Constantinou, “Performance of a Low Complexity Channel Estimator for MC-CDMA Systems over Realistic MIMO Channels’’, 6th Conference on Telecommunications, 9-11 May 2007, Peniche, Portugal. A.Marousis, P.Constantinou, “Channel Identification and Equalization for Multi-Transmit Antenna MC-CDMA Systems with Orthogonal Space-Frequency Coding”, 13th Symposium of IEEE on Communications and Vehicular Technology, IEEE/S-CVT 2006, 23 November 2006, Liege, Belgium. A.Marousis, P.Constantinou, “An Efficient Channel Estimation Scheme for Realistic SFBC MISO OFDM Systems”, European Conference on Antennas and Propagation, EuCAP 2006, 6-10 November 2006, Nice, France. A.Marousis, P.Constantinou ‘Evaluation of a Hybrid Space-Time-Frequency Coded Channel Estimation Scheme for MIMO OFDM Systems’, wseas Transactions on Telecommunications, pp 1563-1570, Issue 9, Volume 5, ISSN 1109-2742, September 2006. IEEE Proceedings of the First Mobile Computing and Wireless Communication International Conference, MCWC 2006, 17-20 Sept. 2006. A.Marousis, P.Constantinou ‘Performance Evaluation of a Channel Estimator Applied in SFBC MIMO Systems for W-MANs’ ACM International Mobile Multimedia Communications Conference, No46, 2nd ICST MobiMedia, Italy, 2006. A.Marousis, P.Constantinou, “Evaluation of an Orthogonal SFBC Channel Estimation Scheme for MIMO OFDM Wireless Systems”, International Conference on Wireless Information Systems and Networks, (WINSYS 2006), 7-10 August 2006, Setubal, Portugal. 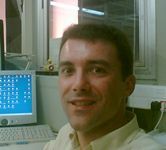 Selected in best papers: http://www.winsys.org/WINSYS2007/Best_Papers_2006.html. A.Marousis, P.Constantinou, ‘Design and Evaluation of a Channel Estimator for Realistic Space-Frequency Coded MIMO OFDM Wireless Systems’, 10th CSCC International Conference on Telecommunications, July 13-15 2006, Athens, Greece. P.Karamalis, A.Marousis, A.Kanatas, P.Constantinou, “Genetic Algorithms in Signal Parameter Estimation” International Conference AIC’2001, Advances in Communications, July 3-6, 2001, Rhodes, Greece. Α.Marousis, P.Karamalis, A.Kanatas, P.Constantinou ‘Design and Simulation of a Vector Channel Sounder for UMTS’ IEEE VTS 53rd Vehicular Technology Conference, VTC, Rhodes, Greece, May 2001. P.Karamalis, A.Marousis, A.Kanatas, P.Constantinou ‘Direction of Arrival Estimation Using Genetic Algorithms’ UMTS’ IEEE VTS 53rd Vehicular Technology Conference, VTC, Rhodes, Greece, May 2001. A.Marousis, C.Veranopoulos, P.Constantinou ‘Radiation Intensity of the Approach RADAR at ‘N.Kazantzakis’ Airport, Heraklion, Crete’. Millennium Workshop on Biological Effects of Electromagnetic Fields, Crete, Greece, September 2000. A.Kanatas, A.Marousis, P.Karamalis, P.Constantinou ‘Development of a Vector Channel Sounder for UMTS’. 2nd Symposium on Applied Electromagnetism of Trans Black Sea Region, Xanthi, Greece, June 2000. P.Karamalis, A.Marousis, A.Kanatas, P.Constantinou, “Design of microstrip antennas for channel characterization receiver system”, 2nd Symposium on Applied Electromagnetism of Trans Black Sea Region, June 2000, Xanthi, Greece. J.Meaburn, P.Boumis, C.Goudis, A.Marousis, D.Harman, ‘Aristarchos Spectrometers: Manchester Echelle Spectrometer (MES-AT) and Aristarchos Transient Spectrometer (ATS)’, 8th International Conference of the Hellenic Astronomical Society, 13-15 September 2007, Thassos Island, Greece. P.Boumis, E.Xilouris, O.Giannakis, A.Marousis, A.Katsiyannis, ‘Aristarchos Instrumentation: Meaburn Measuring Filter Spectrometer (MMFS)’, 9th International Conference of the Hellenic Astronomical Society, 20-24 September 2009, Athens, Greece. C.Goudis, P.Hantzios, P.Boumis, E.Xilouris, A.Katsigiannis, A.Marousis, ‘Aristarchos Telescope: The Final Phase’, 9th International Conference of the Hellenic Astronomical Society, 20-24 September 2009, Athens, Greece. Φ. Κωνσταντίνου, Ν. Μωραΐτης, Α. Μαρούσης, ‘Επιδράσεις Αιολικών Πάρκων σε Τηλεπικοινωνιακά Συστήματα’, 4ο Εθνικό Συνέδριο Ανανεώσιμων Πηγών Ενέργειας (ΑΠΕ): ‘Εφαρμογή των ΑΠΕ προς ένα Φιλόδοξο και Αξιόπιστο Εθνικό Πρόγραμμα Δράσης’, 10-12 Μαΐου 2010, Αθήνα, Ελλάδα.